This mural in St James’s was originally painted for the 1995 “green ribbon” mural by Andrea Redmond. The dove holds the keys that will set the republican prisoners (symbolised by the barbed wire) free. Still standing after a decade or more on Racecourse (see 1998) – a ‘green ribbon’ mural from the ceasefire/GFA period. “Political status now” – one of four such small boards along the Falls. The others are “Join Republican Sinn Féin 1905-2001“, “RSF“, and “Brits out, not sell out“. Below it (cut off) is “Go mall – páistí’ (“Slowly – children”). Islandbawn Street, Belfast. Anti-extradition graffiti in Eastway and Gartan Square, Derry. Please get in touch if you can identify “Fergal” or “Tommy”. 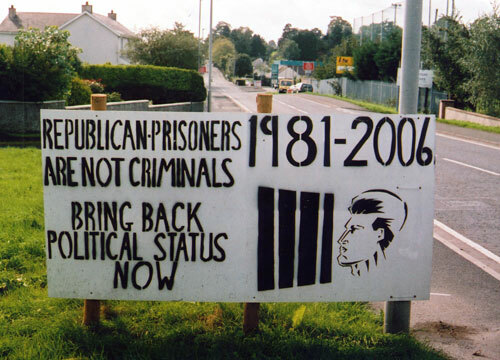 “1981 – hungerstrikers gain political status; 1998 – Good Friday Agreement signs it away; 2006 – political prisoners are again denied political status. Re-instate political status now!” “The hunger strikers died for political status”. “They weren’t criminals then! They still aren’t now!”. Boards on the railings outside the IRSP offices on the Falls Road.